Want to invest in a multi-awarded eco-friendly condominium at the most reasonable deal? 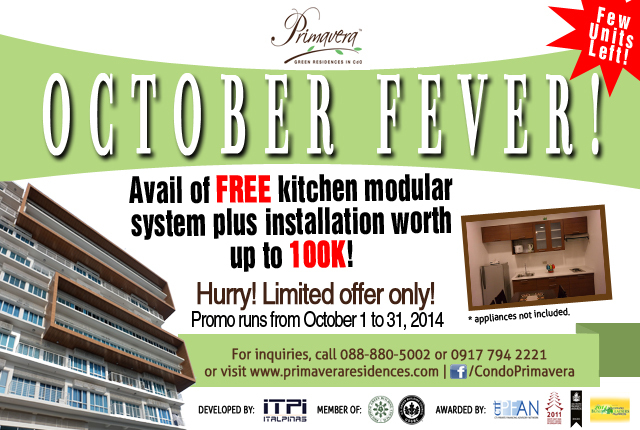 This month, Primavera Residences offers buyers its October Fever promo with FREE Kitchen Modular Cabinet and installation worth up to P100,000!!! In a regular package, buyers get unfurnished units with inclusions of tile floorings, painted walls and ceilings, fitted kitchen sinks, bathroom fixtures, electrical wirings and outlets; however, October Fever promo gives buyers a chance to earn savings of up to P100k with a FREE set of Kitchen Modular Cabinet and its installation. “At Italpinas, we always make sure to please our clients not only with world-class units and facilities but also with quarterly promo offerings; that aside from the already affordable rates, we strive to make it even more reasonable. Indeed the best chance to invest in Mindanao’s first and only multi-awarded eco-friendly building,” Gladys Magadan-Echano, VP of Sales, expressed. Primavera Residences is known for its energy-saving features that include cantilevers to protect the units from direct sunlight, and an indoor courtyard that maximizes the natural ventilation in the area. By June of 2015, solar panels that will provide additional energy for the building’s common areas will be installed on the building’s rooftop. The building is also designed to withstand earthquakes and extreme weather and boasts of 24-7 security. “We are not just giving them discounts but we give them the real thing. Consider this as Italpinas’ early Christmas gift. We want to add more value to the buyers’ purchase; that they [buyers] will not just earn big time, they also help the environment in a bigger note” Echano stated. The green building has garnered several recognitions for its commitment to green architecture and design locally and internationally. Recently, it was named among the winners in the prestigious Asia Pacific Property Awards in the 2014 Asia Pacific regional competition as the Best Mixed-Use Development in the Philippines. It has also been awarded as the Best Condo Development in the Philippines in 2011 (Southeast Asia Property Awards) and a finalist in the Most Promising Clean Energy Investment Opportunity of the Year (CTI PFAN Philippines Clean Energy Investor Forum). “Located in a flood free zone in Uptown Cagayan de Oro, Primavera Residences is a prime spot for business and leisure activities. We want to make it as beneficial as possible for our investors to come and enjoy our month-long October Fever promo from October 1-31,” Echano invited. Primavera Residences, first development of Italpinas Euroasian Design and Eco-development Corporation (ITPI), is a 10-story, two-tower building located at Pueblo de Oro Township offering residential, commercial and office spaces for lease and purchase. All units in the first tower are ready for occupancy while the second tower is slated to be completed later this year. Buyers may choose from studio, one-bedroom and two-bedroom units. For more information on Primavera Residences, visit its website at www.primaveraresidences.com or call (088) 880-5002 or 0917-794-2221.